Hannah Neuenschwander will reign as Miss Rodeo Kansas 2017. She is the 19 year old daughter of Rick and Shannon Neuenschwander. She is from Syracuse, Kansas and a graduate from Syracuse High School. Hannah is currently a sophomore attending Garden City Community College and intends to transfer to Fort Hays State University, where she will complete her Bachelors in Elementary Education. She plans to teach grades 1-3 and loves working with children. Hannah has always had a love for horses and has been riding for as long as she can remember. She competes in Barrel Racing. Breakaway, and Team Roping. Hannah is looking forward to the opportunity to represent her state and the greatest sport on dirt, rodeo!In addition to capturing the Miss Rodeo Kansas title, Hannah earned the Photogenic, Speech, and Modeling awards. Her reign will conclude in December as she represents the Sunflower State at the Miss Rodeo America Pageant in Las Vegas, Nevada during the Wrangler National Finals Rodeo. ​With my year as Miss Rodeo Kansas halfway through, I feel it is time for an update. These 7 months so far have been incredible. I am so fortunate to have been granted the opportunity to travel to both ends of the state, and from one corner of the country to the other. 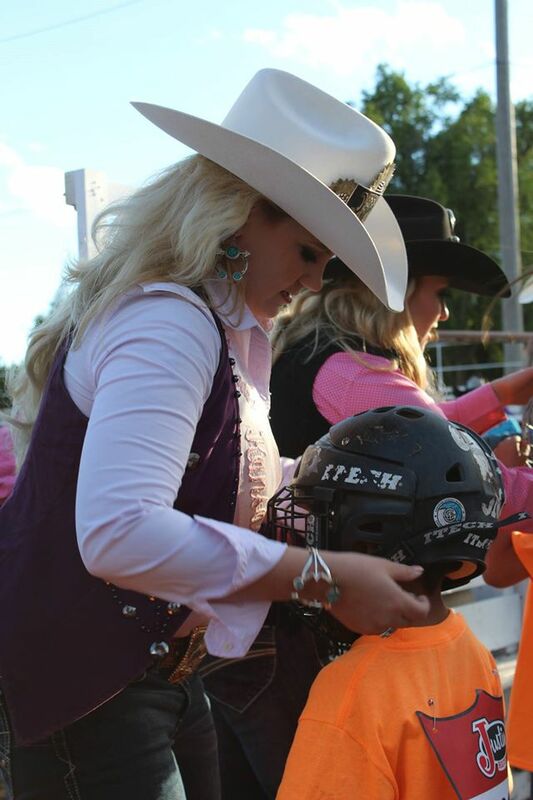 ​My first official appearance as Miss Rodeo Kansas was to WESA Market in Denver, Colorado. Along with me I had my National Director, Katera Kemp, who is a former Miss Rodeo Kansas. She helped me to navigate my way through the large building and crowds. I was able to meet many wonderful business owners and continuous sponsors of MRK. I was also able to attend the Wrangler party and was given the opportunity to speak on camera about the official jeans of cowboys. After leaving Denver, it was back to planning my official coronation. I was crowned on a rainy evening in Garden City, with my family and friends there to support me. It was a fun evening with food, music, and dancing. As incredible as Florida was, I found myself saying, “There’s no place like home.” I arrived in Kansas at 2 am, and was happy to be back. From there, I began planning The Miss Rodeo Kansas Benefit Barrel Race. I had many racers attend and was thrilled with the outcome, considering the fires that ravaged through my beautiful state. Kansans truly stick together during hard times. People from all corners of the state banded together to help those in need. Inspired by my fellow Kansans, I set up a trailer to load with things for those affected by the fire. It is times like that, I know I am home. I have made several other appearances though out my year, such as, Beef Empire Days in Garden City, the Abbyville Rodeo, Plainville Rodeo, Ft Hays State University Rodeo’s, Prairie Rose Western Days, Cowboy Camp in Dodge City, Garden City Bible Camp, and many more. ​During the last weekend of January, I attended the Monster Buck Show with one my biggest sponsors, The Kansas Fur Harvesters Association. It was there that I spent some time with my teen, the president of the Fur Harvesters, and many spectators. To kick off the month of February, I attended the Miss Teen Rodeo Kansas Crowning Celebration, to support Krissie’s year. The next morning I checked out of the hotel, and took a shuttle to the airport. I love airports, you meet some incredible new people from all corners of the country. While waiting to board my flight, I met Crystal Yoder (Gray now), Mrs. Kansas United States 1994, who chatted with me before boarding her flight. Crystal told me to enjoy every second of your year because it goes by fast! I thought about what she said as I sat on the plane, heading to Kissimmee, Florida for the Silver Spurs Rodeo. While in Florida, I faced my fear of reptiles by kissing alligators and wearing a snake. 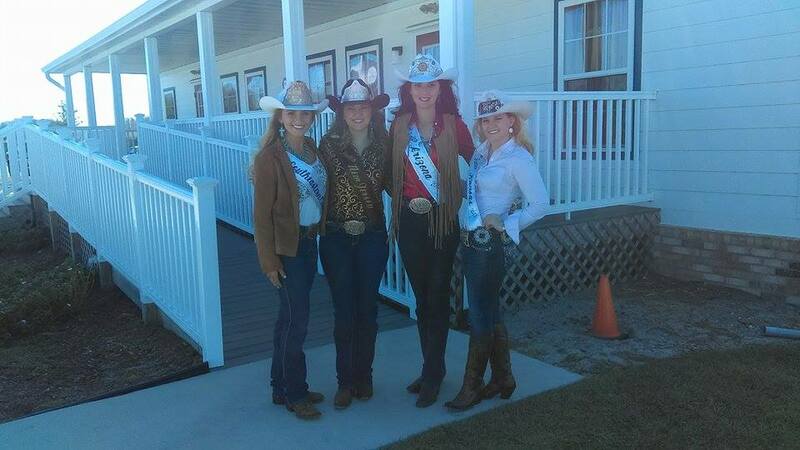 The other state queens and I also visited several elementary schools, beaches, and of course attended the rodeo! One of my favorite memories I have of that week, was while Miss Rodeo Illinois, North Dakota, Iowa, Washington, and I were stuck in traffic. It was a lot of stop and go when all of a sudden we had been rear ended. We pulled into the parking lot of Starbucks, and climbed out of the vehicle. The woman who had bumped us stepped out and said, “Of all the people in Florida, your pickup is the one I hit.” We exchanged numbers and went on our way. My host family there was wonderful, and I thank them for the wonderful time they showed Miss Rodeo Illinois, Emily Westfall, and myself. I am looking forward to the Dodge City Round Up Rodeo, where I will crown the 2018 Miss Rodeo Kansas. We have several talented ladies that I would be proud to crown. Be sure to “Get the Heck into Dodge,” this August to witness the crowning of the next MRK and the greatest sport on dirt, rodeo!